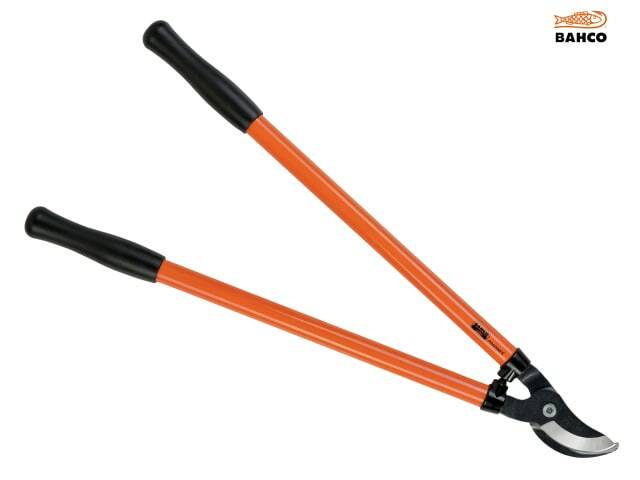 High quality bypass loppers for pruning trees and shrubs in the home and garden. The cutting blade of this loppers slides past a counterblade in a scissor action hence the name bypass. The pivot bolt of the Bahco lopper is offset from the natural centre line of the tool. This unique design feature creates a slicing motion during cutting, which greatly assists the pruning of live wood and spreads the cut over a larger area of the blade for increased life. The hook shape of the Bahco lopper counterblade enables a large cutting diameter and holds the branch steady during cutting. The sap groove is a recess which reduces the area of contact between blade and counterblade and results in less friction and sticking. The blades are made of blue steel.